Once upon a time it seemed likely that Craig Gordon would be celebrating his 100th Scotland cap sometime around now. But this was before injury intervened to curtail a career that was progressing so smoothly. 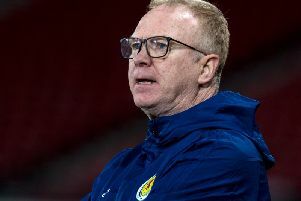 His reason for joy on Tuesday night was not at reaching such a milestone with Scotland, which once appeared a formality. Rather, it was simply making it to 100 games since his comeback 18 months ago from a serious knee injury. Gordon marked this no less satisfying achievement by performing superbly to keep a clean sheet in Scotland’s 1-0 win over Denmark. Such a reminder of his worth means there remains a remote chance the 33 year-old could yet make it to a century caps. But given Scotland’s embarrassment of riches in his area, it’s little wonder Gordon is simply focusing on reaching the Roll of Honour with his 50th cap. “I’ve a wee while to go yet,” he said, mindful of the competition that has seen him start only two Scotland matches since his return. Tuesday’s was cap No 44, while his first was as long ago as 2004, when he made his debut against Trinidad and Tobago at Easter Road. This was brought to mind as he travelled in the team bus to Hampden on Tuesday because of who he was sitting next to – 18 year-old Celtic team-mate Kieran Tierney, preparing to win his first cap. Gordon also more than played his part. After performing so well against the Danes he has done no harm to his chances of seizing back the No 1 jersey from David Marshall and Allan McGregor, who took advantage of his absence to jump ahead of Gordon in the queue. McGregor staked his own claim last Thursday when excelling while keeping a clean sheet in the 1-0 win against Czech Republic, with Marshall having been preferred by Gordon Strachan in the last qualifying campaign. In the meantime, he will continue to relish the thrill of playing top-class football at all. It says everything about Gordon’s struggles, and his ability to overcome them, that he is simply delighted to have strung together a long series of first-team games. There was a time when many feared such a fine goalkeeper, for whose services Sunderland paid Hearts £9 million, had been lost to football. So this consistent run is something to celebrate. “When milestones get closer they do start to enter into your head,” he said. “I think Tuesday was my 100th game since my comeback from injury, so that was special for me as well. It’s a bit of a milestone, so when things like that come together, it’s good to go out there and do well.” It’s unusual for footballers to be so statistically minded. Normally it is reporters who break the news to players that a significant games tally has been reached. It underlines how conscious he is of the hiatus in his career that Gordon has carefully measured out his progress post-recovery. “I don’t normally count these things, but I checked during the week, because I thought it must be close,” he said. “But I didn’t realise I just had one game to go. I played 55 games last season – three of them for Scotland – and I’d played 44 for Celtic this season – so that made 99, I think! He made his ‘second career debut’ against St Johnstone for Celtic in August 2014, having joined the Parkhead club after a spell training with Rangers. Fraser Forster’s transfer to Southampton meant the No 1 spot at Celtic was up for grabs, and Gordon seized his chance. Originally he felt satisfied at the thought he might play even just a handful of times in that first campaign. It quickly became apparent to those watching that he was back to his best. Gordon himself realised he was feeling as good as he was before his injury, perhaps better. “Probably after six or seven games with Celtic, I realised I was in pretty good shape, and that my reflexes were still what they had been before,” he said. “I didn’t feel weaker in any way – in fact I probably felt better than I did previously, when I was maybe carrying injuries and trying to get through games. He now turns his thoughts to game 101 since his comeback, against former club Hearts on Saturday, as Celtic continue their bid to complete the double this season. Much more potentially lies in store for Gordon.